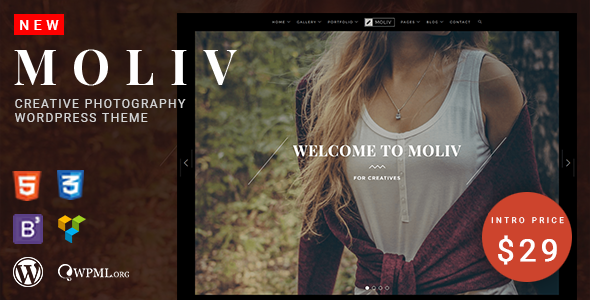 MOLIV is a unique handcrafted WordPress Theme to present your work with your clients with a clean and modern design. Build beautiful professional websites, perfect for photographers, to present your portfolio and even show your profile. MOLIV utilizes the Customizer for most of its settings as well as plenty of Meta Options on each custom post type. Visual Composer Page Builder is included with the theme to let you create a unique website with 28 MOLIV elements handcrafted with plenty of options. MOLIV utilizs the Bootstrap framework to present you the best experience possible on mobile and tablet devices. MOLIV offers light and dark skins to match your style. WooCommerce is embedded with the theme in order to give you an opportunity to start selling your artwork as well as photography.